For use on any grounded electrical system, DETEX Voltage Detectors are available in seven models that cover a range from distribution class to transmission line voltages up to 550 kV. Biddle offers six electronic "beeper" models and one model with LED indication for greater visibility when testing indoors. The beeper-style electronic detectors provide audible and visual indication of the presence of phase-to-ground ac voltages, in accordance with ANSI C84.1-1982 standards. 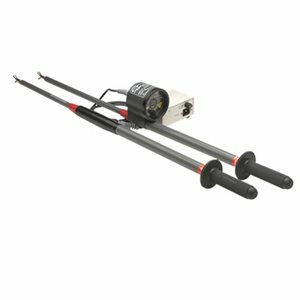 The 6.9-kV model is equipped with a telescopic pole. All other models are fitted for universal spline mounting on a hot line pole rated for the voltage of the system being tested. Electronic voltage detectors for use on distribution line voltages (Cat. No. 514360 series) provide a single red LED. Detectors rated for transmission line voltages (Cat. No. 514242 series) provide four LEDs for improved visibility at greater distances. The LED-indicating voltage detector is designed for indoor testing of grounded ac systems. A bright LED indicator provides easy visibility in poor lighting conditions. During testing, the presence of voltages within the detector's operating range will illuminate the bright LED lamp. A built-in piezoelectric voltage source provides a test feature to ensure that the detector is operative before use. The self-test is activated by a pushbutton. The LED detector is equipped with a 48-in. (1219-mm) telescopic pole calibrated and marked for voltages within the ratings of the detector. These demarcations assist the user in adjusting the pole to the length required for safe operation. The pole retracts to 34 in. (864 mm) for convenient storage in a vinyl carrying case when not in use.